I’ve been wanting to give quilling a try but it is kind of everything that makes me crazy in a craft: lots of little fragile pieces that have to be perfect and should look like a realistic thing when combined. These are my weak areas. Still, quilled pieces are so lovely that I’ll give it a shot. 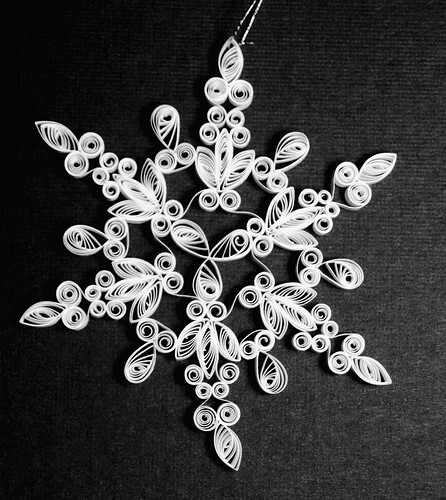 Join me as I make a quilled snowflake that won’t look nearly as beautiful as the photo above! Now that Valentine’s Day is over and my husband has received his present I can show it to you here. This was fun to put together. I downloaded the Love Letters design from Urban Threads and embroidered it on a scrap piece of denim. Then I cut a mat from my handmade paper and framed it all. I still can’t quite believe how professional it looks! – I am a champion procrastinator and this trait will not serve me well during this blog project. There are some seriously time consuming projects coming up. If I try to leave them until the last minute I will fail. – It seems to me that papermaking is something where you can do the messiest part in a big batch and then stretch out the tedious draining and drying part over more days. For example, I could dump the slurry in the bin and whip out a few more pages now without needing to fling paper pulp all over my kitchen again. – I need to experiment more with my camera settings. Later today I may post a photo of the final card that I’m sending to my parents for their anniversary using this paper. I also might start next week’s project which is bound to take quite a lot of time. I hope you’ll check back! Tonight I finally stopped procrastinating and I tried my hand at making some paper. It’s currently drying so I’ll post photos and my lessons learned tomorrow. For now I just want to reflect on the experience so I’ll remember this in the future. Papermaking is awesome! Sure, it’s messy and some amount of work and my results are still unknown, but I made paper! A person could get pretty creative while making paper. I added some pink dye and some flowers to my last couple of sheets just to see how they’ll turn out. I can imagine being intentional about the types of paper used (old fortune cookie fortunes, maybe? ), the colors, and the textures. Even the smells could be altered (wet paper smells kind of nasty). I tried the food processor because my blender is broken but it didn’t work quite as well as I’d hoped. Mostly it was just really messy. There are little bits of paper pulp all over my kitchen. Still, in the end I had pulp. Actually, I had too much pulp. I seriously overestimated how much paper I would need to make my slurry. As a result, I still have loads of cut up paper and a bin full of unmade slurry. If I hadn’t started this so late in the week (thanks stomach flu) I could have churned out a lot of paper. What you see above is what I have left after making a few sheets. It’s going to go into a bucket for another day. The photo below shows the paper in its current state: drying between stacks of fabric and newspaper and weighted down by a board. Every so often one of us goes and stands on the board. Before I go to sleep I’ll take the paper out and leave it someplace safe to dry. I hope I make the time to do this again one day. Stay tuned tomorrow (or later today if you’re seeing this Friday morning) for the results! All I need to buy is some screen and I can get started on the project. I spent today in bed with a stomach bug and my husband broke my blender trying to make me a smoothie. Hopefully tomorrow will go better and I’ll have homemade paper by the end of the week! You are currently browsing the archives for the Papercraft category.